← An aircraft worth its weight in gold? Yesterday I finished reading Einstein’s book “The World as I see it” (in Spanish “Mi vision del Mundo” -205 pgs.-, Ed. Tusquets, from the original “Mein Weltbild”). 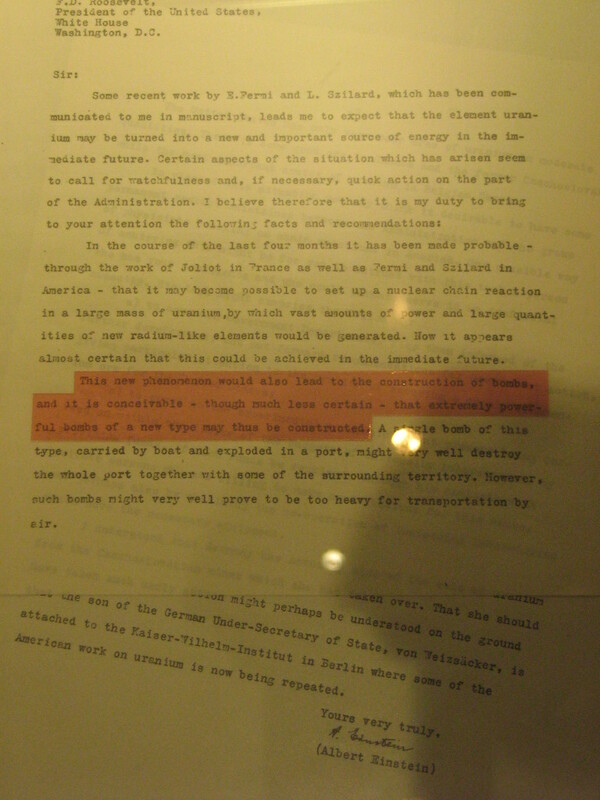 He explains his resolution for writing the letter to F. D. Roosevelt telling the necessity of conducting experiments to study the possibility of building the A-bomb. The only reason: the danger of the Germans working toward the same. He says he was completely conscious of the horrendous outcome for human kind but found no other way out despite his solid pacifism. Einstein's letter to F.D. Roosevelt. Hiroshima Peace Memorial. He explains in his book that he understands Judaism more as a tradition centred in moral issues concerning practical matters than a religion based on faith. He defends the creation of a nation for the Jews because of the hostility found in other countries, admits the nationalistic approach of that creation and says that if the situation was different he would be the first one in rejecting all forms of nationalism calling for a universal human community. He joined Zionism as a consequence of the anti-Semitism he found in Germany. The majority of his letters on this issue come from the ‘20s and ‘30s. Einstein died in 1955, before the Suez-Sinai and the Six-Day wars. The A-bomb issue is quite controversial. I was not aware of the history behind it, till I went to Hiroshima Peace Memorial and I was surprised Einstein took part in the decision of A-bomb development and test. The excuse of developing it to prevent Nazis from doing it, and killing a couple of million people to proof the world they had it first… hasn’t convinced me yet.